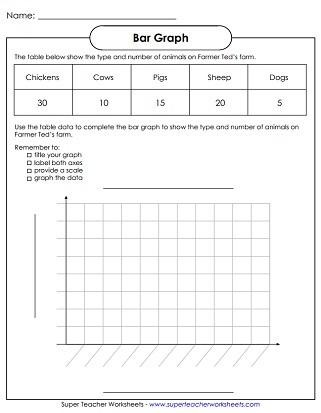 Here is a complete set of basic, intermediate, and advanced bar graph worksheets for teachers and homeschool families. 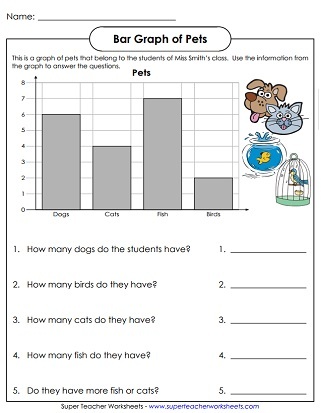 Bar graph of pets that belong to students in a classroom; Scale counts by 1s; Approximately first grade level. Bar graph of eggs laid by hens; Scale counts by 1s; Approximately first grade level. Bar graph of Flowers in a garden; Scale counts by 1s; Approximately first grade level. Create a bar graph to show how many raffle tickets were sold during the week. Approximate grade level: 3. Read the bar graph to determine how many runs were scored in a baseball game; Approximate grade level 2-3. Christina surveyed her friends to find out their favorite subject in school. The tally chart shows the results. 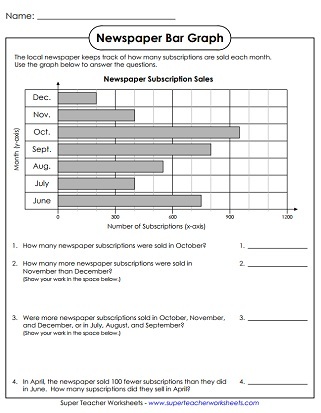 Answer the questions and make a bar graph to show the data. Kids can make their own bar graphs with this blank axis and grid. A collection of circle graph (pie graph) worksheets.